At the beginning of March, Dr. Karen Smith and Dr. Keith Stephenson worked with a team of archaeologists from SCIAA to conduct numerous survey tests on the grounds of Hobcaw House. Working over the span of a week, the archaeologists found a variety of artifacts from both the historic and prehistoric era. Some of historic materials showed evidence of a massive fire, and may have belonged to the wooden two story home (often referred to as the “Old Relic”) that predated Hobcaw House and burned down in 1929. Some of the pottery sherds discovered date as far back as 2,000 BC, proving that Hobcaw Barony had been inhabited by humans thousands of years before Europeans landed on the continent. The Between the Waters team was able to check in with Dr. Smith after she and her crew had returned to the SCIAA office in Columbia. 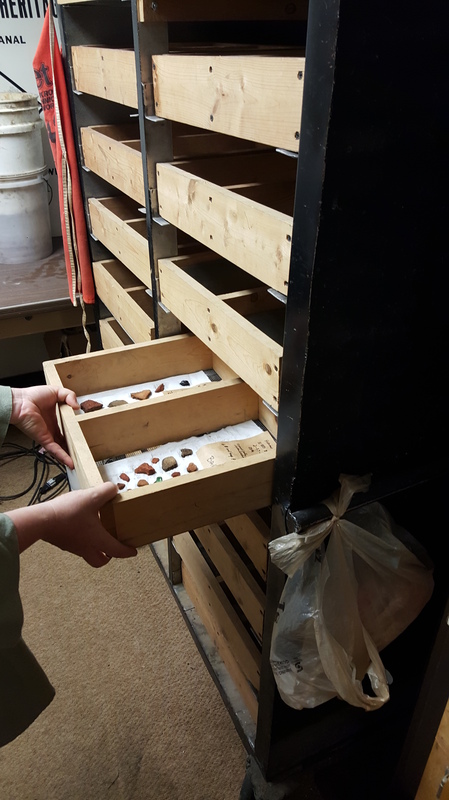 Dr. Smith and Brandy Joy, an archaeological student at USC, took us on a behind the scenes tour of the SCIAA lab, where we discovered just how hard archaeologists work, both in and out of the field. The entire collection of artifacts found at Hobcaw House, bagged and inventoried on the shelf and waiting to be cleaned. While still doing fieldwork, the archaeologists spend their evenings storing their finds in bags and numbering each item according to its shovel-test location. 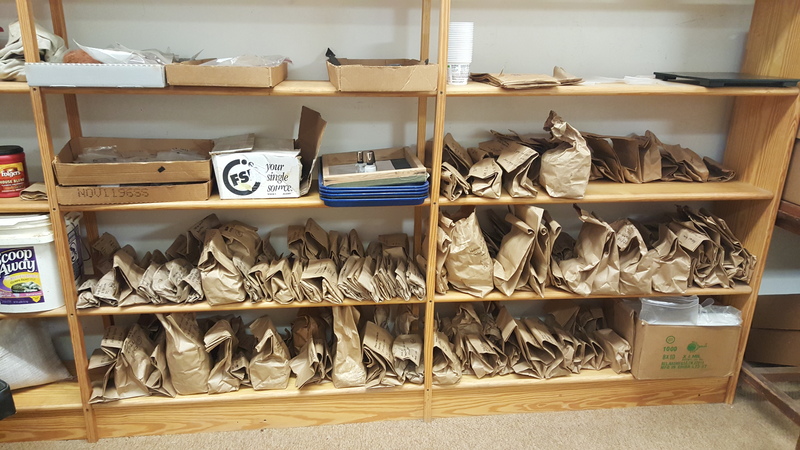 Back in the lab, the first priority is to organize all of the bags by number according to the inventory conducted in the field. Once the bags are inventoried and all of the artifacts are accounted for they are stored until they can be cleaned. USC Archaeology Student Brandy Joy demonstrating how to clean artifacts with a tooth brush. The cleaning process for the artifacts is surprisingly simple. The artifacts are rinsed with water over a screen and carefully scrubbed with tools (a toothbrush is shockingly efficient at removing dirt without damaging the artifact). Once the artifacts are cleaned, they are shelved (according to bag number) and left to dry for a number of days. 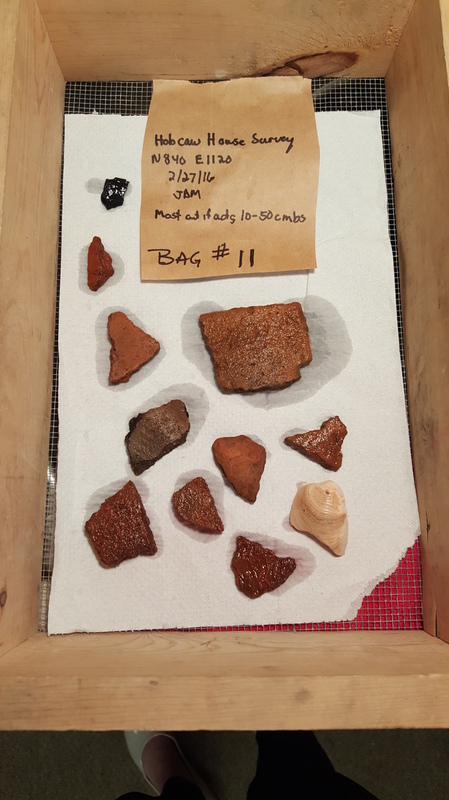 Artifacts from bag #11 after rinsing. You can see brick fragments and pottery sherds. Some artifacts are not as easy to clean and require extra TLC. Objects made of iron, for example, can rust and become badly corroded from being buried in the soil or from exposure to salt air/water. One treatment for corrosion is electrical reduction or electrochemical cleaning. To put it simply – the item is placed in a plastic container filled with with a sodium carbonate, or soda ash, solution. A low electric current is run through the solution – a process that is exceedingly efficient at removing almost all traces of corrosion and rust. A more thorough explanation of the process can be found here. Iron can also be preserved and sealed with hot wax. This process requires that the wax be heated to a boiling point, and the artifact dipped into the wax. Any moisture absorbed by the artifact evaporates and the wax serves as a barrier, preventing moisture from re-entering the object and promoting corrosion. Bags #11 and #12 placed in the drying wrack after cleaning. 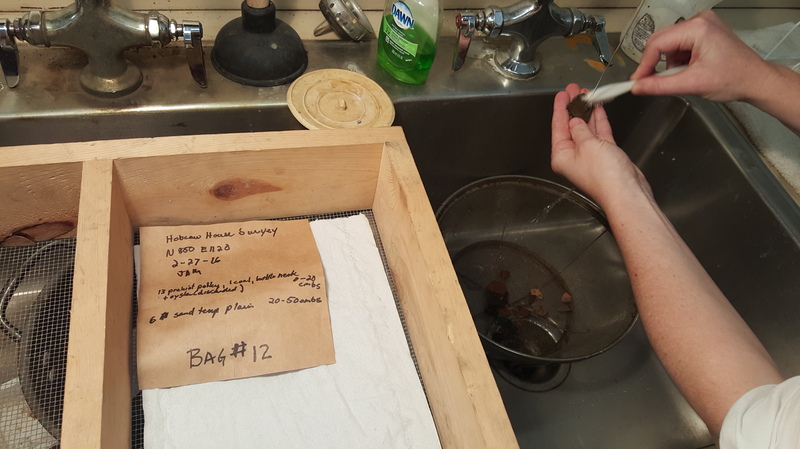 Once the artifacts are clean and completely dry, they are re-bagged, ready to be catalogued into DAACS.org (Digital Archaeological Archive of Comparative Slavery), a standardized cataloguing database utilized by archaeological organizations across the United States. Eventually the items discovered at Hobcaw House will be entered into DAACS, where they may one day be searched and viewed by the public.